Oh, well those too, Mr. S. I've actually acquired a few interesting ones since last year, which I'll be talking about soon. I've got a freakishly awesome variegated bilbergia about to bloom! seed catalouges count as books, right? If it wasn't for garden books, I wouldn't make it thru the winter. Do you have any favs? There's a 5 best gardening books meme starting. 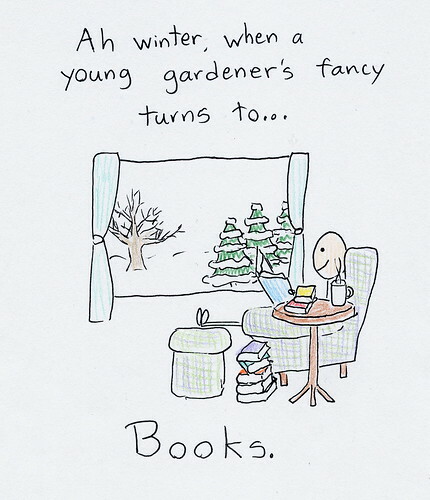 In addition to books, does anyone read gardening magazines in winter? I've been dreaming of aquascaping this winter - although I don't think it would be as satisfying - not enough wrestling with weeds and soil. Oh, seed catalogs are the best. Couldn't do winter without them. Oh, of COURSE I have favs... but it would be hard to pick just 5. I'll start working on it in case the meme comes my way. I don't read many magazines. Sometimes I to the university library where they have giant masses of practically pornographic english magazines like Gardens Illustrated and drool my way through them, though. Oh, I did that a couple winters ago! It was excellent fun, but I found I lost interest in the summer, and the tanks got all gross looking. I may revisit it someday. Hey you guys , I have a great book to recommend . Its called "The Brother Gardeners- Botany , Empire and the Birth of an Obsession"
I loved this book it covers the time of botanical wonders pouring into England during the 17 and 1800s. When the English went from being gardeners to being GARDENERS , A great fast paced read with tons of info and lots of juicy botanical dish . ( Linneaus naming the ugliest of plants after those who blocked his efforts to revamp nomenclature because they thought it was far too sexual ). Exhaustively researched and highly entertaining !